The Visitation Sisters have put me in the middle of a rewarding, unlikely relationship between an old friend of theirs and an older friend of mine. It all revolved around a 20-year-old Honda automobile that used to belong to Jim Shoop, a reporter colleague of mine dating back to our days at The Minneapolis Star in 1963. During the past two decades, Shoop and I have used that car to go fishing dozens and dozens of times. It’s carried our rods, reels, tackle bags, and rain jackets. Reluctantly, he had to part with the car this year when he and his wife moved into a retirement village in Apple Valley. Their apartment was big enough for most of their “stuff,” but the garage had room for only one car. The Honda Accord had to go. 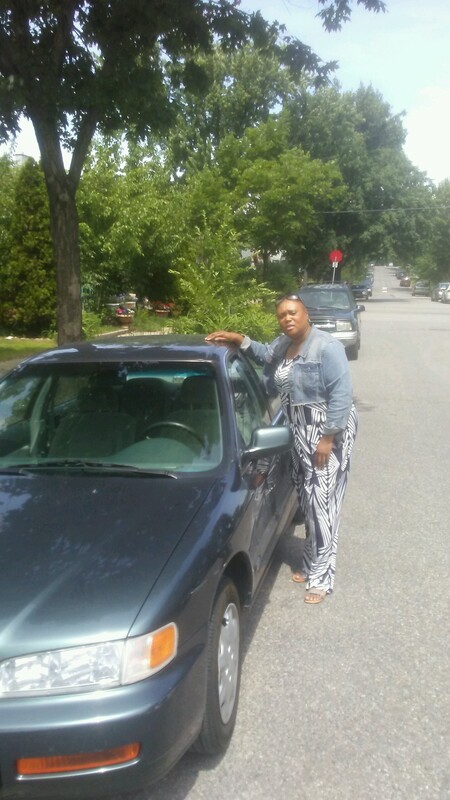 The Sisters knew of someone who needed a car: Alfreda Riddley. The former family liaison aide at Bethune Community School had been hoping for wheels for months. Shoop, who’s known the Sisters for years, was a willing donor. Riddley needed all the help she could get at the time. She’d just lost her job because of budget cuts in the Minneapolis School District. Since 2011, she had worked at Bethune and loved her job. She had started a resource room at the school that had a food pantry and access to computers. Her duties included helping parents write resumes, get training, find jobs, seek housing, arrange daycare, and generally cope with the demanding task of raising a family and keeping kids interested in learning. One of the parents she’d “bugged” to stay involved with the school showed up at Bethune a few years later, telling Riddley he was grateful for the push he got from her. Riddley came to Minnesota with her parents from west central Texas. They came looking for a better life. It was not without a few bumps in the road for Riddley, who experienced some racist taunts in school. But she graduated from Edison High School and got trained as a nurse’s assistant at MCTC (Minneapolis Community & Technical College). “These ladies,” she said, “are kind and compassionate. They do care and that is for real.” Riddley also admits she likes the fact that the Sisters are feisty, a trait she shares with them. She gives off a no-nonsense demeanor, one that does not suffer fools or phonies. The best compliment of all comes from Sister Mary Margaret McKenzie, who suffered a stroke in 2016. She has let the other Sisters know that when Alfreda Riddley is sitting with her, she’s at ease and at peace.